FORWARD OPERATING BASE TABAC, Afghanistan – In just a few short hours, I saw both sides of Sangin. On one hand, photographer James Lee and I visited a shura, or meeting, that brought together 67 boys and 25 girls at the gates of this base, the headquarters of Dog Company, 1st Battalion, 7th Marines, out of Twentynine Palms, Calif. Most of the children sat obediently in straight rows on the ground as two interpreters and two Marines with a Female Engagement Team taught lessons about geography, civics and poetry. A few hours later, we heard our first gunshots fired in anger during this trip to Afghanistan. Sitting in on a resupply convoy mission from FOB Tabac to nearby Patrol Base Georgia, we heard harassing fire nearby aimed at Dog Company’s 1st Squad, 2nd Platoon, which was maneuvering on foot to meet the convoy at Georgia. We watched and followed Marines with Dog Company’s mobile section as they scanned an open field for enemy fighters and hopped on a compound roof to provide security for the squad that had been under fire. The contrast captures a large part of the dynamics here in Sangin district. Events like the shura are used to not only build a working relationship with families, but to gather valuable information about the “atmospherics” in a region and how coalition forces are perceived. The harassing fire this afternoon underscores that Sangin is still a very dangerous place and likely to see an uptick in violence after the ongoing poppy harvest ends in coming days. To backpedal, we arrived here on Tabac on Friday morning. The base is best known as FOB Alcatraz, but it was given a new name within the last year as part of the effort to put an Afghan face on the war. It sits in the Upper Sangin Valley along Route 611, a place that was notorious for violence as recently as last summer. 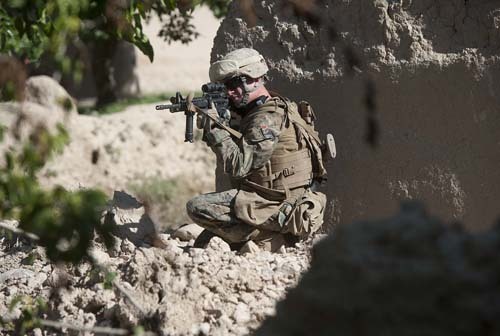 Marines with 1/7 now man the entire Sangin area of operations and work with the growing Afghan National Security Forces. Not long after arriving at Tabac, we were introduced to Staff Sgt. Kimberly Taylor, 27, and Cpl. Austin Walswick, 21. They’re part of 1/7’s FET team, and they work with Dog Company to build an understanding of the region and its inhabitants. Today’s shura stands as an excellent example of that. As someone who took teaching classes in college, I was impressed to see that most of the kids listened closely and participated in the lessons taught by the FET Marines and a husband-wife interpreter team, Salim and Susan Mandokhil of Loudon County, Va. That’s no easy feat anywhere. The children, ranging in age from about 2 to 12, stood at attention during Afghanistan’s national anthem then recited the provinces surrounding Helmand in Afghanistan. 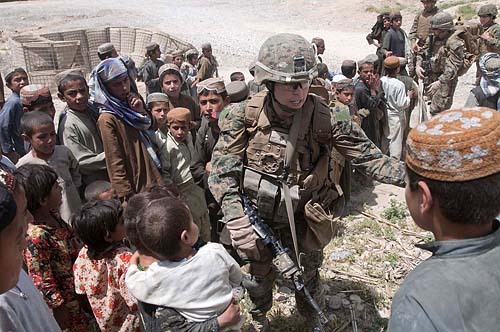 In between, the Marines urged the children to be honest with coalition forces and to watch out for Taliban fighters. The warning wasn’t unlike something you’d give a child in the U.S. about talking to strangers. Taylor also raised an issue from a previous shura: A male Marine providing security was wounded in the face by a boy shooting rocks with a slingshot two weeks ago. He won’t be welcome back at another event for kids until he writes a letter of apology to the Marine, Taylor told the other children. Later in the day, we hopped out on the resupply mission. It gave us a chance to see more of Route 611 and to meet more of the Dog Company grunts, who are spread out in several outposts in Upper Sangin. That got complicated when the shooting began. Safely inside the wire at Georgia, we heard a handful of gunshots in the distance. Dog Company’s mobile section, led by Cpl. Jason Skow, pushed a patrol out from Georgia to assist the other nearby squad. Once they arrived at Georgia, the Marines who had been under fire said none of the potshots were particularly close. They questioned whether the three fighters they saw botched a more complex ambush by opening fire too quickly. “We saw two of them running through the treeline, but they were a good 500 meters away,” said the squad leader, Cpl. John Drake. The Marines involved said they haven’t seen many ambushes in recent days, but they expect the violence to pick up by next month after the poppy harvest. Great Pictures and stories! Please stay safe. That’s an awesome group of marines being both teachers and protectors! We’re so proud of you and will continue our prayers!! I so appreciate hearing information from the source. We are way too busy in this country with politics to give a face to what’s going on in Afghanistan. Thank you for keeping us informed. Dan, my son said he met you and James! He was with the 2nd Platoon 1st Squad, Lcpl Trevor Erickson! Drake is his squad leader. He called me yesterday and failed to mention the gun fire ironically! While 500 meters may seem far, it just validates their presence in the region as the harvest ends. Be safe and thank you both! Guess I failed to mention that was my son that got nailed in the face from the sling shot! He called home and told his dad one day! Aye, I remember meeting him now at PB Georgia after the commotion. It was brief, but his squad seemed to be in good spirits. Thanks! So many familiar faces in this picture, so many memories. Glad to see you ladies are carrying on with what we left behind. Tell all the kids Shawna and Soraya say hi, and we miss them!